Early mapping of Australia with incomplete northern shoreline. 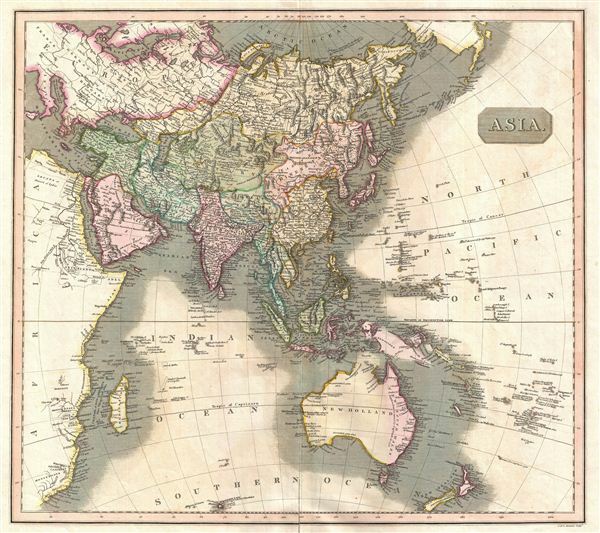 This fascinating hand colored 1814 map depicts Asia and Australia. The whole is beautifully engraved in the minimalist English style pioneered in the early part of the 19th century. Thomson maps are known for their stunning color, awe inspiring size, and magnificent detail. Thomson's work, including this map, represents some of the finest cartographic art of the 19th century. Relief is shown by hachure with towns, cities, and major topographical features identified. By the early 18th century most of the world had been explored, but the notable exceptions are evident on this map. These include an uncertain shoreline in Northern Australia (here identified as New Holland), an extremely primitive and speculative mapping of New Guinea, and a largely unmapped African Interior. The Liakhov Islands, just north of Siberia, make one of their first cartographic appearances. These islands, discovered, but the Russian trader Ivan Liakhov, contained so much fossilized Mammoth Ivory that for nearly 100 years scientists speculated that the islands were in fact composed of Ivory. Engraved in 1814 by J. and G. Menzies and issued as Plate no. 30 for Edinburgh cartographer John Thomson's 1817 issue of the New General Atlas. Rumsey 1007.038. Phillips (Atlases) 731. Newberry Library: Ayer 135 T4 1817.